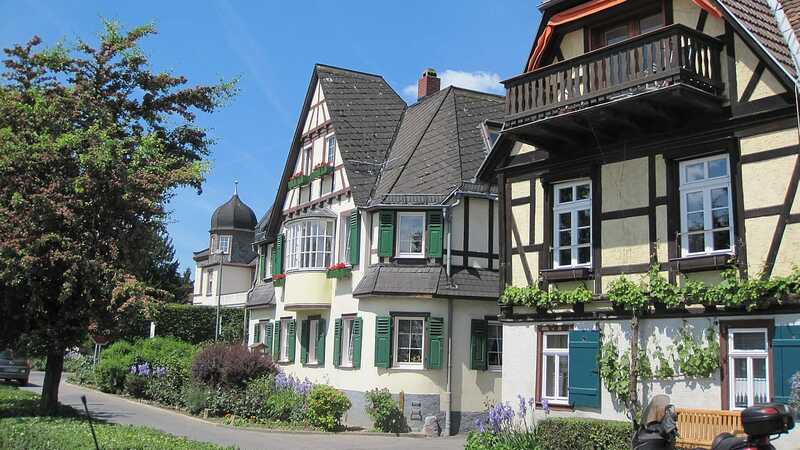 The name of this tiny wine-growing community derives from the monastery of Eberbach and the stream with the same name, that flows into the Rhine river. Its history also goes back 1000 years. Already at the beginning of the millenium Erbach possessed a chapel that was continually extended. The parish church was inaugurated in 1250. The construction of the late-gothic St. Marks's Church started in the middle of the 15th century. The evangelical Johannes Church dates from the second half of the 19th century. This church was a present from Princess Marianne of Prusia to the Erbacher. She was the daughter of King William the I. of the Netherlands and after a disappointing marriage, established herself in Erbach in the Reinhartshausen Castle, today a five-star hotel. Other aristocratic and noble families influenced this splendorous wine-growing community as well. Erbach became first famous for its excellent wines; the wine estate "Marcobrunn" with its fountain monument is known worldwide. Also another fruit: the strawberry, made this town famous. The red queen of the fruits was grown here, sold in the big market places and delivered to the kings' and emperors' courts. The Erbacher still celebrate the Strawberry Festival every June, where everything is about strawberrries and wine.